Written especially for those who coach tween and teenage actors, this delightfully fresh workbook tells you the how, when, what, and why of theatre games for young performers. Starter scenes allow first-time performers to ease onto the stage in baby steps. Spontaneity is encouraged along with etiquette and basic acting principles. The concepts of pantomime, improvisation, character development, voice, and body control are all presented in game formats with exercises. Nine chapters include: Before You Begin, Preparing, Starter Scenes, Exercises, Games, Improvisation, Pantomime, Non-Acting Theatre Games and Activities, and Developing Your Program, plus an Activities Index. Read more...Anyone working with young actors will find this theatre book exceptionally helpful, and you’ll love that it’s written by Suzi Zimmerman, author of the best-selling Introduction to Theatre Arts. This book aims to give theatre teachers the tools they need to not only play a game or teach an exercise, but also to teach an understanding of the reasons and benefits of each exercise. 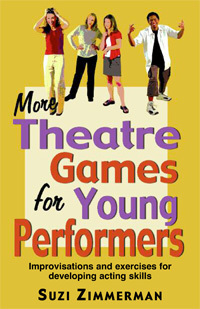 This book tells the how, when, what and why of theatre games for young performers. All the basics of pantomime, improvisations, voice control, monologs and dialogs are presented in game formats.